Plants are the Strangest People: Epipremnum or Philodendron? I've decided to take this piece out of the profile and give it its own post, because it'll shorten the actual profile and because it's also a small, manageable subject that comes up a lot. And the subject is, how do you tell the difference between a pothos (Epipremnum aureum) and heart-leaf philodendron (Philodendron hederaceum)? 1. If the new leaves are glossy, the plant is probably an Epipremnum. 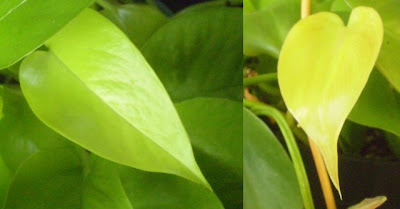 If new leaves are matte, the plant is probably a Philodendron. Epipremnum is on the left, Philodendron on the right, for all of these photos. 2. If the new leaves are folded along the midrib, the plant is probably an Epipremnum. Philodendron leaves are pretty much flat for the leaf's entire life. 4. There is also a subtle difference in the leaf tips: Philodendrons have a more exaggerated "drip tip," an extension of the end of the leaf which must serve some purpose, but which has never really been satisfactorily explained to me. Something about enabling the leaves to shed water more quickly or something. Epipremnums (and most other members of the Araceae, actually) also have these, but they're less prominent. 5. If the new growth is the same color as the old, or only slightly lighter, it's an Epipremnum. New Philodendron hederaceum1 leaves tend to be reddish, especially if the plant is in good light. I.e., the plain green variety starts out slightly olive; the yellow variety starts out reddish or orangish, etc. 6. If the petioles2 are grooved, it's an Epipremnum. Petioles which are smooth along their whole length belong to Philodendron. 7. If developing leaves are protected by a sheath, which later dries up and falls off, you have a Philodendron. If there's no sheath, it's an Epipremnum. Does it actually matter which is which? Well, yes and no. 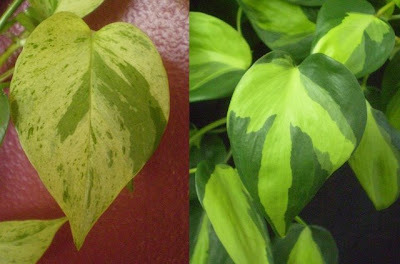 Both plants are pretty long-suffering, vining plants with heart-shaped leaves.3 In general, if conditions are acceptable to grow one, the other would also grow there, but in some situations one or the other is preferable: Epipremnum handles neglect, low light, and dry heat better, for example. Philodendron has a slight edge when it comes to propagation, cooler temperatures,4 and overwatering. Both would prefer more light than they usually end up getting, though Philodendron, at least, will sunburn if the light is too bright: I've never known Epipremnum to burn, but the leaves get black tips and margins if it's too wet or if there's root damage (among other reasons). There are also certain long-term differences in appearance, and if you can convince them to climb something, there will be even bigger differences in appearance: Philodendron leaves develop a velvety texture (eventually), and Epipremnum leaves get Monstera-like perforations. I feel like being able to call things by their actual names should be a good enough reason to learn the difference all by itself, but then, I'm pedantic that way sometimes. 1 I have to specify hederaceum because this is specific to it. Among Philodendrons in general, new growth is frequently redder or lighter, but not necessarily. 2 Petiole is a botany vocabulary word for the stem-like structure connecting the leaf to the actual main stem. They could have just called it "stem," but then people would have to spend a lot of time specifying which stem, over and over, and there'd be confusion, cats lying with dogs, and all that, so a new word was invented for this particular kind of stem. This is how jargon gets born, and it doesn't have to be any more intimidating to you than you want it to be. 4 Though neither plant particularly likes cooler temperatures, pothos seems to be the only one that actually starts to freak out if it gets too cold: the Philodendron just sort of stops growing for a while. Pothos is especially touchy, in my experience, about getting watered with cold water, which is a problem every winter at work because we can't control the water temperature. So it alternates between drought and freezing all winter long, and then starts to recover when the cold water out of the tap warms up. The Philodendrons probably don't like the cold either, but they're less vocal about it. No you are not the only one, it drives me nuts when someone calls my epipremnum a philodendron. Calling them pothos is fine. I love your blog! I look forward to reading every new post-- let me tell you, if you wrote a book, I would buy it. I just wanted to make a comment about point #4 (concerning the leaf tips). When the soil is too moist, root pressure builds up (especially at night when the stomata are closed). This root pressure will push excess water through the xylem and out through structures at the leaf tip called hydathodes. The process is called guttation. This is why sometimes you see little droplets of water at the tips of pothos or philodendrons, particularly in the morning. Thanks for the breakdown. I have always thought that E. aureum and P. hederaceum looked so different that I couldn't quite figure out how people could get them mixed up. It was an early clue that my personal perceptions are not universal. Not just that I am more attuned to plants than the average Josephine*, but that the way I see and observe things is not necessarily the way others do. *I do have an area of plant blindness. I have a lot of trouble distinguishing between the various cactus genera. I can recognize Mammillaria and Astrophytums pretty easily. For anything else I'm lost. I'm somewhat plant-blind when it comes to shrubs. I recognize about 30-40% of the perennials pretty easily, I know a few trees though not very many, but shrubs all look more or less the same to me. Thanks again as always. I now know that I've got an epipremnum, not a philodendron. Oh my, you are amazing. I inherited a plant from my grandma. They all said it was a philodendron. And I kept seeing photos of heart-leaf philos and thinking, "no, that is NOT my plant. hmm!" and now I know! Great post, down to the letter it describes my EPIPREMNUM! For the sheer purposes of having the correct name, I am delighted and relieved. It certainly did freak out when encountering the cold, and it also freaked out when I brought it from my grandma's gloomy apartment (in which she kept the shades always shut) to my own sunny apartment (in which i placed it by an Eastern window). But then I brought it back to life, and so it is very dear to my heart. hey!can i know actually how many species are there for the money plant? ?Is it considered as one as there is some with all green leaves whereas some with yellow shades?? The info on this will be appreciated very much! There are a few plants which are called "money plant," but Epipremnum aureum is the only one, to my knowledge, that vines. There are several varieties of Epipremnum aureum, with solid green leaves, green and yellow leaves, solid chartreuse leaves, or green and white leaves. Some cultivar names are 'Jade,' 'Neon,' 'Marble Queen,' 'N'Joy,' and 'Pearls and Jade.' They're all the same species, though. Thanks a lot, this post is just perfect. I know now for sure that my plant is a Philodendron. I searched the internet and can confirm that this is the most fantastic post clearly explaining the differences between Epipremnum and Philodendron. Your side by side pictures are second to none. Scindapsus and Epipremnum are both valid genus names, but apparently the plants belonging in each are very similar. Epipremnum aureum is still sometimes called Scindapsus aureus; Scindapsus pictus is still occasionally seen as Epipremnum pictum. Both species also have synonyms in the Pothos genus as well, according to Plant List. Pothos is a current and valid genus, but neither E. aureum nor S. pictus belongs in it. Carnivorous reptiles (snakes, some lizards) would be fine with either one, since they're not going to be trying to eat the foliage anyway. I don't know if herbivorous reptiles (turtles, some lizards) would know to stay away or not, and it's possible that they wouldn't be poisoned anyway if they tried it (reptile bodies being different than mammal bodies), but if you're looking for trailing/vining plants that are non-toxic, you might want to look at this list. THANK YOU for the clarity! I was corrected (incorrectly) at work when I called the plant in my office an epipremnun, but I see that I was correct! Sort of wish I could bring this article to the attention of the task master, but I shall not. There are more important things to learn and I'm so glad I found your blog! Thank you, Mr. Subjunctive, for this post. I'd always assumed my was was a philodendron, but have recently started researching to confirm. I do have one question: My plant does have ridged petioles, but it also has the white sheaths. Of all the traits you listed, it seems that those 2 were the least ambiguous. So, of those 2 traits, is one primary over the other? I have a hard time imagining a plant that has both. (Perhaps you have some third thing altogether?) It's easier for me to imagine smooth petioles that look grooved than non-existent sheaths that look like they exist, though, so I suppose I'd say the sheaths are more conclusive. Where does your plant fall on the other listed traits (especially the folded/flat new leaves)? If you want to send me a photo by e-mail (remove the "1" from mrsub1junctive@outlook.com), I could probably make a more confident guess. I can't think of anything off the top of my head that would fit what you're describing, but there are other vining aroids with heart shaped leaves in Monstera, Scindapsus, Philodendron, Epipremnum, and Rhapidophora. Lovely post. It was driving me nuts what do I have in my guest room upstairs and now it know. It is Epipremnum. I still don't get it. My plant has characteristics of both. My mother had originally told me it was a creeping jew, but when I looked it up, I RELIZED it looked nothing like that. It's viney, mostly green leaves, some really dark green, some not. Some with lightyellow stripes, chuncks, or speckles.some have folds when small and some are born flat. It literally describes both from your definitions and has become quite challenge in trying to identify. Help?? E-mail me a picture (remove the 5's from 5mrsubjunct5ive@outlook5.com) and I'll tell you. Hello I just opened your blog. Its very interesting. I am just concerned with the plants sitting on my desk. I looked at your pictures and I think some of my plants are philodendron. I learned from other articles that some plants emit carcinogens, or cancer forming substances. Do philodendrons emit carcinogens therefore making them dangerous for people with a family cancer history? Thank you very much I am looking forward to hearing from you. And, just for the record: if you mean spewing carcinogens out into the air, I'm not aware of any plants that do that. If you're thinking of Euphorbia tirucalli, the possible carcinogens are in the sap, are not released into the air by the plant, and don't appear to trigger cancer unless specific other conditions also apply: infection by the parasites which cause malaria, Epstein-Barr virus infection, direct contact with the plant's sap. And we don't even know for sure if the plant is involved; as far as I know, science has not yet demonstrated a link. As far as I've heard, there is no reason to think that growing E. tirucalli indoors in a pot increases your risk of cancer, and even less reason to think that any other houseplants increase your risk of cancer. I know this is one of your older articles, but thank you so much for this! A while back, I bought a couple of small plants from my local nursery labeled heart-leaf philodendron. I brought them into work, and a coworker started telling me about how she loved my new pothos and how hers used to wrap around her whole office. And then another member of my department complimented me on my pothos as well. While I was happy to receive the compliments on my new plants, I was a bit frustrated that these plants labeled philodendron were being called pothos. I'm about 90% sure that they are indeed philodendron, as labeled. The plants are completely green, so that's no help. But, there are no obvious grooves on the petioles, there are sheaths where the new growth is that does dry up and fall off, they have the exaggerated leaf tips, and my brand new leaves are reddish in color. Some of my new leaves are shinier and a few of the leaves on one plant have folded a bit, but I think that's less conclusive than the other points, and those few leaves are -- I assume -- from a couple weeks' worth of neglect. I've finally, concretely identified my beautiful Epipremnum! I've been trying to confirm its genus for weeks now with no success. Every time I read more opinions and articles, they made me more confused, but your blog post clearly identifies the differences in great detail and I am so grateful. Such a great post, you totally helped me identify my recently acquired sweet plant as an epipremnum. Thank you!